MANSFIELD — On Wednesday, U.S. 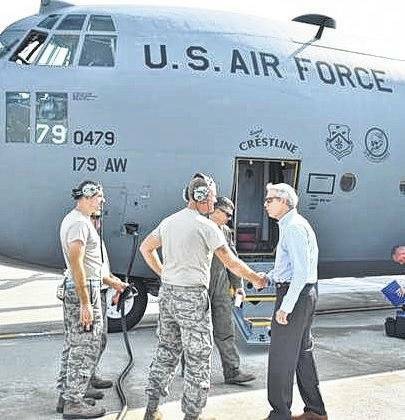 Senator Rob Portman (R-OH) visited the 179th Airlift Wing based at Lahm Airport. Portman met with base leadership and with airmen serving at the base. The 179th Airlift Wing helps transport personnel and cargo throughout the United States and the world and participates in disaster relief efforts and other domestic emergencies. This was Portman’s sixth visit on his five-day military facility tour. Portman’s representative said the Senator has worked on behalf of the 179th and its airmen to modernize the Air Force’s C-130 aircraft, back them in their mission to support overseas contingency operations, and support them in their participation in the State Sponsorship Program with our allies in Eastern Europe in support of NATO. Portman says he is a strong supporter and advocate for Ohio’s military facilities and research institutions. They provide significant jobs and economic impact across Ohio and directly influence the national security of our country. Forty-three of Ohio’s 88 counties are impacted by these types of facilities. Ohio Defense spending accounted for more than 66,000 direct jobs, more than $4 billion in salaries, and had had an economic impact of more than $14 billion. U.S. Senator Rob Portman visited Mansfield Lahm Airport on Wednesday. Lahm is the home of the 179th Airlift Wing of the Ohio National Guard. Portman took a tour in a C-130 named Spirit of Crestline and visited with leadership and staff at the base. U.S. Senator Rob Portman was in Mansfield on Wednesday, visiting with leadership and airmen at the 179th Airlift Wing of the Ohio National Guard. Portman is on a five-day trip visiting similar bases.